NRO title: "Erdoğan and Assad at War"
Perhaps Prime Minister Recep Tayyip Erdoğan hopes that lobbing artillery shells into Syria will help bring a satellite government to power in Damascus. Maybe he expects that sending a Turkish war plane into Syrian air space or forcing down a Syrian civilian plane en route from Russia will win him favor in the West and bring in NATO. Conceivably, it's all a grand diversion from imminent economic crisis due to borrowing too much. 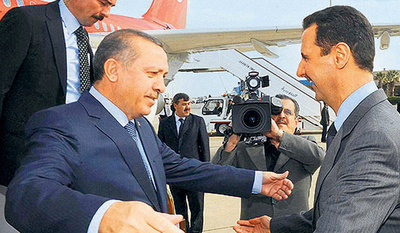 Erdoğan and Assad in happier times. Erdoğan's actions fit into a context going back a half-century. During the Cold War, Ankara stood with Washington as a member of NATO even as Damascus served as Moscow's Cuba of the Middle East, an arch-reliable client state. Bad Turkish-Syrian relations also had local sources, including a border dispute, disagreement over water resources, and Syrian backing of the PKK, a Kurdish terrorist group. The two states reached the brink of war in 1998, when the Assad government's timely capitulation averted armed conflict. A new era began in November 2002 when Erdoğan's AKP, a clever Islamist party that avoids terrorism and rants about a global caliphate, replaced the center-right and -left parties that long had dominated Ankara. Governing competently and overseeing an unprecedented economic boom, the AKP's share of the electorate grew from one-third in 2002 to one-half in 2011. It was on track to achieving Erdoğan's presumed goal of undoing the Atatürk revolution and bringing Shari'a to Turkey. 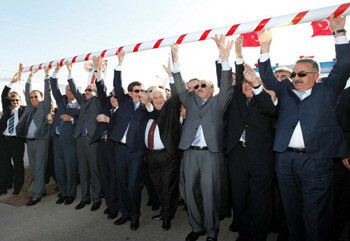 Turkish and Syrian government ministers met in 2009 at a border crossing and symbolically eliminated the division between their two countries. Feeling its oats, the AKP abandoned Washington's protective umbrella and struck out on an independent neo-Ottoman course, aiming to be a regional power as in centuries past. With regard to Syria, this meant ending decades-old hostilities and winning influence through good trade and other relations, symbolized by joint military exercises, Erdoğan and Bashar al-Assad vacationing together, and a bevy of their ministers literally raising the barrier that had closed their mutual border. What initially seemed like a masterstroke has turned into Erdoğan's first major misstep. The outlandish conspiracy theories he used to jail and cow the military leadership left him with a less-than-effective fighting force. Unwelcome Syrian refugees crowded into Turkish border towns and beyond. Turks overwhelmingly oppose the war policy vis-à-vis Syria, with special opposition coming from 'Alevis, a religious community making up 15-20 percent of Turkey's population, distinct from Syria's Alawis but sharing a Shiite heritage with them. Assad took revenge by reviving support for the PKK, whose escalating violence creates a major domestic problem for Erdoğan. Indeed, Kurds – who missed their chance when the Middle East was carved up after World War I – may be the major winners from current hostilities; for the first time, the outlines of a Kurdish state with Turkish, Syrian, Iraqi and even Iranian components can be imagined. Damascus still has a great power patron in Moscow, where the government of Vladimir Putin offers its assistance via armaments and United Nations vetoes. Plus, Assad benefits from unstinting, brutal Iranian aid, which continues despite the mullah regime's deep economic problems. In contrast, Ankara may still belong, formally, to NATO and enjoy the theoretical privilege of its famous Article 5, which promises that a military attack on one member country will lead to "such action as …necessary, including the use of armed force," but NATO heavyweights show no intention of intervening in Syria. 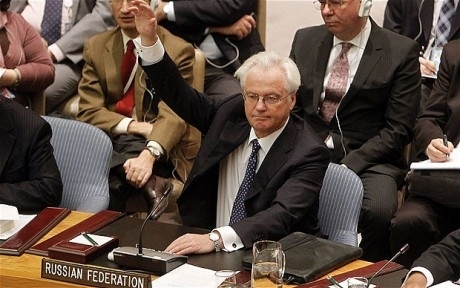 Vitaly Churkin, the Russian ambassador, vetoes a draft resolution at the U.N. Security Council. A decade of success went to Erdoğan's head, tempting him into a Syrian misadventure that could undermine his popularity. He might yet learn from his mistakes and backtrack, but the padishah of Ankara is doubling down on his jihad against the Assad regime, driving hard for its collapse and his salvation. To answer my opening question: Turkish bellicosity results primarily from one man's ambition and ego. Western states should stay completely away and let him be hoist with his own petard. Oct. 16, 2012 update: I did not have space above to discuss Erdoğan's intention to remain in power another 11 years, until the 100th anniversary of the Turkish republic in 2023, when he will be 69 years old, providing more insight into his ambition and ego. at the beginning of October, a bomb fell on the Turkish border town of Akcakale, killing five civilians. Turkey responded by shelling Syrian targets. Although Prime Minister Erdoğan has said he does not want war, much of his rhetoric since suggests otherwise. Speaking at a political rally in Istanbul last week, Erdoğan said, "What did our forefathers say? 'If you want peace, prepare for war.'" The Turkish parliament, dominated by Erdoğan's Justice and Development Party, approved a motion authorizing military intervention. And just this Sunday, Turkey announced a ban on all Syrian aircraft in the country's airspace, after grounding a Syrian passenger plane coming from Russia that it suspected of carrying munitions. All signs point to a wider regional conflict, and if you've been following these events from the United States, it indeed appears as though Turkey is just one incident away from sending in troops. All his fiery rhetoric and heroic vows to stand up to Assad would also imply that the Turkish people are behind him. They are not. In fact, all of this chatter over whether the Turks will go to war might be pointless. NATO has shown little interest in intervention, and Erdoğan is unlikely to make any truly bold moves without a coalition of the willing. Oct. 20, 2012 updates: (1) Spoiling for war, Turkish forces have fired on Syria 87 times, killing 12 Syrian soldiers and destroying several tanks, reports Fikret Bila in Milliyet newspaper. The current Syrian conflict is presenting NATO with a dilemma. Either it attempts to conduct a conventional deterrence, against its members states' political will, and remains blocked in a Cold War structure which is no longer efficient or it takes the present situation as a unique opportunity to reform the meaning of the Article 5 and 6 of its charter and add dynamism and flexibility to its configuration. The response which the alliance will give to the current Syrian aggressions against Turkey will be instrumental in defining the NATO long-term attitude.